The Rotary Club of Forres held a Quiz, Raffle and collection for Children in Need. They raised a total of £2,000. ​For more information visit their facebook page. The Rotary Club of Kintore, Kimnay & District collected £208.03 for Children in Need at their local supermarket. The Rotary Club of West Fife hold an "Ultimate Quiz" each year to raise funds for charities and this year, donated £1,750 to BBC Children in Need. The picture shows the winning team from 2017. Congratulations! ​For more information and pictures visit their website. The Rotary Club of Pickering & District organised a Countryfile Ramble for BBC Children in Need. They raised a total of £220. 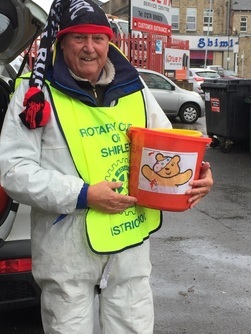 The Rotary Club of Shipley collected £3,367.18 for Children in Need at two busy junctions one at Baildon and the other at Windhill. A huge effort by all and a great total for BBC Children in Need. The Rotary Club of Kinver hosted their annual "Alan Dedicoat Quiz". BBC’s “Voice of the Balls and Strictly Come Dancing" Alan Dedicoat has hosted the quiz for the past 18 years. The photo shows this year's winning team with Alan. The final total raised for the evening was £928. The Rotary Club of Brandon & District came up with a great idea to help raise money for BBC Children in Need. 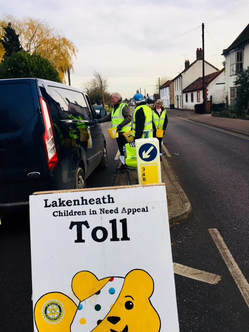 They set up a "Pudsey Toll" in a modern highwayman / Robin Hood twist. They raised an impressive £2,200. The Rotary Club of Cambridge Rutherford organised two collections in their local shopping centre. ​They raised a tremendous £2,867.09. 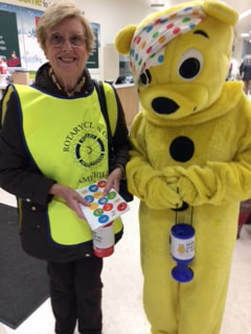 The Rotary Club of Cambridge Sawston organised a collection at their local supermarket and visited local schools with Pudsey. ​They raised an impressive £1,682.19. The Rotary Club of Bourne End & Cookham visited schools with the official Pudsey Bear between 12th and 15th November. 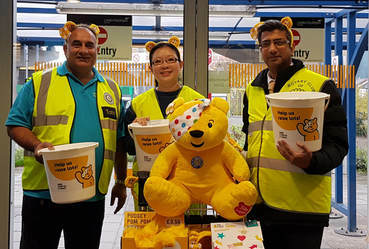 They organised Giant Pudsey Raffles in local businesses and helped at the Heathrow Airport Collection. 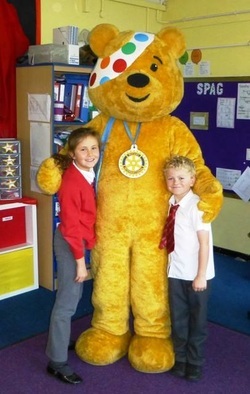 The Rotary Club of Burnham Beeches visited 10 schools with the official Pudsey Bear. 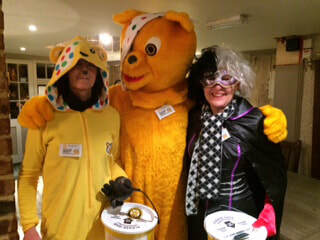 The Rotary Club of Crowthorne & Sandhurst organised a street collection for BBC Children in Need. ​They raised an impressive £1,513.85. 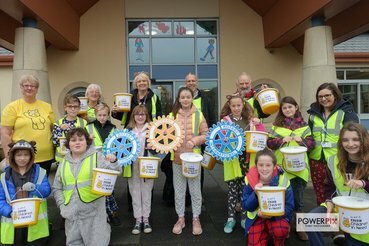 The Rotary Club of Faringdon & District organised a Giant Pudsey Raffle with their RotaKids club for BBC Children in Need. The Rotary Club of Maidenhead Bridge organised a Giant Pudsey Raffle and helped at Heathrow Airport, collecting for BBC Children in Need. The Rotary Club of Misbourne Matins visited 10 schools with the official Pudsey Bear. They organised Giant Pudsey Raffles in local businesses and community groups. They raised a total of £8,362.24. The Rotary Club of Misbourne Matins and Rotarians, Rotaractors and Interacters from District 1090 and beyond descended on Heathrow Airport on 16th November 2018. The team had over 300 volunteers manning all 4 terminals, landside and airside! The Rotary Club of Witney organised visits to their local schools and a care home with the official Pudsey Bear. The children and young at heart absolutely loved it! They raised £1,289.80 for BBC Children in Need. The Rotary Club of Maidstone Riverside organised a huge Swim Relay with 43 teams taking part asking for sponsorship in aid of Children in Need. They raised a staggering £8,503.86. The Rotary Club of Edgware & Stanmore raffled Giant Pudsey Bear teddies at Marcel Fairs antiques fairs and at Edgware Metro Bank. They raised £329.24 for BBC Children in Need. 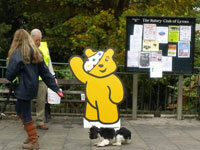 The Rotary Club of Epping organised a Ramble for BBC Children in Need. The total collected was £519.15 . The Rotary Clubs of Newham & Tower Hamlets joined forces to collect at London City Airport on Friday 16th November. They had a Giant Pudsey Bear and wore Pudsey ears to draw attention to themselves. The Airport was very busy as, due to fog, a lot of flights were delayed. This is the first time Rotary has collected for BBC Children in Need at London City Airport. The 7 volunteers collected £514.62 for BBC Children in Need. ​For more information visit their website - Newham Rotary, Tower Hamlets Rotary. The Rotary Club of Roding visited local schools and their local supermarket with the official Pudsey Bear. Overall they raised £1,500.38 for Children in Need. 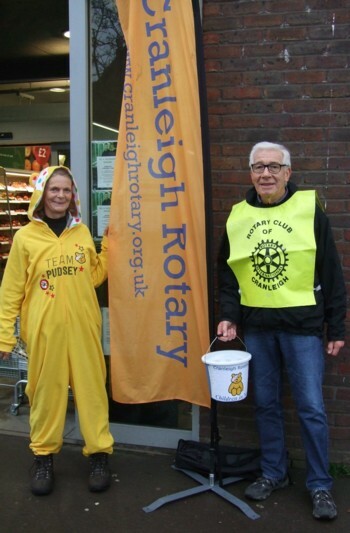 The Rotary Club of Cranleigh organised a collection outside their local supermarket. They raised an impressive £902.50. The Rotary Club of Horsham organised a huge Pudsey Party in Horsham Town Centre during October Half Term with Dave Benson-Philips providing music for the children, American Police cars on display and a local bird sanctuary brought along some birds of prey to hold. 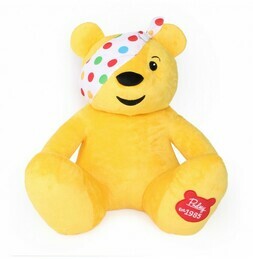 The Rotary Club sold official Pudsey merchandise from their stall and also in November at the town market. The BBC sent a film crew down to capture some footage used on BBC1 on 16th November 2018 during the appeal show. They raised an impressive £2,500. The Rotaract Club of Royal Holloway University of London held a merchandise sale stall at the University and invited Pudsey along for selfies with the students. They raised £181 for Children in Need. The Rotary Club of Twickenham held a Giant Pudsey Teddy raffle. The Rotary Club of Narberth & Whitland donated a Giant Pudsey Bear to their local schools and helped the schools with their collections. Overall they raised £1,101.17 for Children in Need. 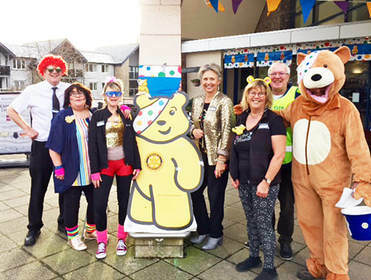 The Rotary Club of Ilfracombe Compass wanted to raffle a Giant Pudsey Bear to raise funds for BBC Children in Need, but had no way of getting hold of one. After an appeal on Facebook, a lovely family offered to give a Giant Pudsey a lift! The raffle was a huge success and the Rotary Club also collected at their local supermarket. They raised £1,171.18 for Children in Need. The Rotary Club of Ruthin held a street collection and supermarket collection to raise as much as they could. They raffled off a Giant Pudsey Teddy at one of their collections. They raised an amazing £2,000 for BBC Children in Need. The Rotary Club of Southport Links collected donations from shoppers at their local supermarket dressing up in style! They raised a staggering £3,200 for Children in Need! The Rotary Club of Lunesdale organised a bucket collection at their local supermarket. They raised £1,000 for BBC Children in Need. The Rotary Club of Penrith organised a fantastic family-friendly Countryfile Ramble which attracted lots of local families. They raised £510.44 for BBC Children in Need through entries and donations. The Rotary Club of Brue Valley went visiting with Pudsey and Friends to pubs in local towns and villages. They raised £1,034.44 for BBC Children in Need. The Rotary Club of Audley raffled 2 Giant Pudsey Bears in their local pub, The Boughey Arms and Alsager Beauty Salon. Together with club donations, they raised £300 for BBC Children in Need. The Rotary Club of Bloxwich Phoenix held a HUGE Charity Auction with loads of prizes, including a Giant Pudsey Bear. They raised a massive £1,885 for BBC Children in Need. The Rotary Club of Burslem raffled a Giant Pudsey Bear. They raised £683.98 for BBC Children in Need. The Rotary Club of Leek raffled a Giant Pudsey Bear. They raised £414.34 for BBC Children in Need. The Rotary Club of Stone and District collected in and around Stone town centre. 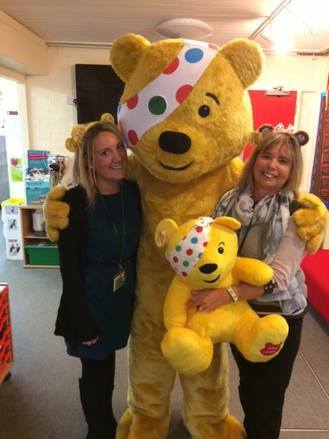 They went on a tour of local schools and nurseries with the official Pudsey Bear to spread the word and raise cash. They also raffled off some Giant Pudsey Bear teddies. Altogether they raised £5,092.58 for BBC Children in Need. The Rotary Club of Uttoxeter raffled off a Giant Pudsey Bear, taking him on a tour of the town! They raised £352 for BBC Children in Need. The Rotary Club of Ampthill & District held a collection at their local supermarket. ​They raised £804.77 in total. The Rotary Club of St Albans Priory collected money from commuters travelling through their local train station. ​They raised £880.25 in total. The Rotary Club of Lymm collected in their village centre. They raised £436.46 for BBC Children in Need. Rotary sent volunteers along to the Car and Music festivals set up by Chris Evans in aid of Children in Need. Each Rotarian was tasked with selling raffle tickets - this year there were some amazing prizes! Over £80,000 was raised by the raffle over the two events, one at Bolesworth Castle, Cheshire, the other at Laverstoke Park Farm, Hampshire. The picture on the right is from Carfest South 2018. The picture below is from Carfest North 2018.